We offer Non-Resident Indians a complete range of services, help them to stay in control of all your activities in India. As an NRI, do you face difficulties in managing your Investments, Portfolio, Tax Returns, getting RBI clearances or complying with your statutory obligations? Don't get frustrated. 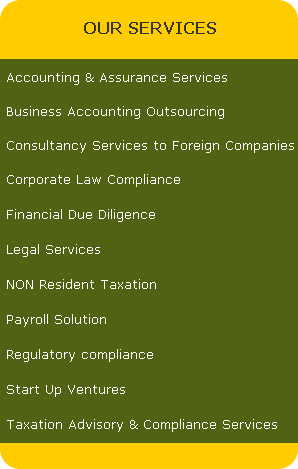 We now offer you a range of services you have been looking for in India. We offer a complete range of service from the simple task of depositing your interest/dividend warrants in your account to preparing your accounts, filing tax returns and obtaining permission/clearances, advice on your investments and portfolio advisory services. All this is done by keeping you well informed on a regular basis through the Internet. In short, you are in control of your activities in India without having to be here. Receive statements, reports, accounts and any other information regularly.